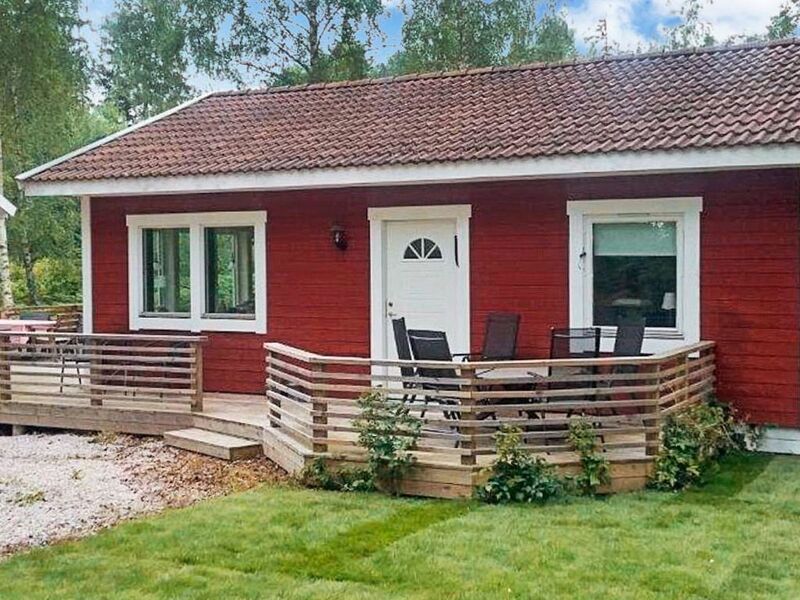 This pretty holiday home is set in Loftahammar, north of Västervik, on the beautiful east coast. The cottage is tastefully decorated and features two connected terraces. The closest beach is only 400 metres away and the town centre is 500 metres away. The cottage has an open-plan enrance hall, kitchen, and living room. The kitchen features the basic amenities as well as a dishwasher. The lovely living room has a large sofa, a TV, and a DVD-player, and opens onto the back terrace. There are two bedrooms featuring three single beds and one bunk bed. The bathroom has underfloor heating and features a WC, a washbasin, a shower, and a washing machine. The cottage is set on a large, natural plot of 1000 square metres. The terrace at the back of the house is all of 36 square metres and features outdoor furniture and a barbecue grill. Your cottage is only half a kilometre, or a few minutes' walk, from the town centre where you will find a grocery store, restaurants, a pizza place, a café, a bakery, a petrol station and a turist information office. Apart from giving advice on places to visit, the tourist office can also help you rent boats, canoes, and kayaks. Why not try your hand at fishing? It is free of charge in Östersjön. The closest beach is only 400 metres from the house. It is a child-friendly, sandy beach with a grassy area. There are also two larger public beaches 4 and 8 kilometres away. The town of Loftahammar offers a art exhibitions and events during the summer. There are plenty of interesting places within driving distance, for instance the charming Flatvarp, 25 kilometres away. Loftahammar is surrounded by scenic nature and beautiful walking paths. You will be close to the sea as well as open landscapes and beautiful forests. You will be within driving distance (2,5 hours) of the part of Småland that is called &#8220;The Kingdom of Crystal&#8221; because of it's many glassworks ( https://www.glasriket.se/en ). This is where the world famous Kosta Boda glassware is made. When you visit Kosta, don't miss the elk park there! The charming town of Vimmerby is only 1,5 hours from the cottage. This area is the setting of many of Astrid Lindgren's beloved children's books such as Emil of Lönneberga. The children will really enjoy Astrid Lindgren's World. Katthult and Bullerbyn are also close. Or why not make a daytrip to Mariannelund and find out how sweets were made in the olden days? The town of Kalmar is another great destination for an excursion. It is set by Kalmarsund and you can drive right over the bridge to the charming island of Öland. Welcome to beautiful Småland!